Yesterday the 100th anniversary of the end of the First World War was commemorated around the globe. Across the UK, charities were heavily involved in Armistice Day ceremonies to remember the fallen. Several charities were involved in the annual Remembrance Sunday event at the Cenotaph in central London. The Royal British Legion, which runs the poppy campaign, was among those at the ceremony. The RAF Association was also among the organisations that laid wreaths. In friendship and in service one to another, we are pledged to keep alive the memory of those of all nations who died in the RAF and in the Air Forces of the Commonwealth. Proudly and thankfully #WeWillRememberThem. The British Red Cross, which also attended the Cenotaph memorial event, marked the day by releasing a number of colourised and rarely seen historical photos of Red Cross volunteers during the Great War, including these tweeted by the historian Dan Snow. The There But Not There charity campaign has raised £4m over the past few months for six charities that offer support for veterans, including Walking With The Wounded, Combat Stress and the Commonwealth War Graves Foundation, with the sale of Tommy silhouettes and figurines. It aims to raise £15m overall. To commemorate the 100th anniversary, the charity shone a large-scale Tommy onto several UK landmarks, including Warwick Castle. Guy's Tower was lit up this week commemorating the British and Commonwealth troops who died in the First World War. 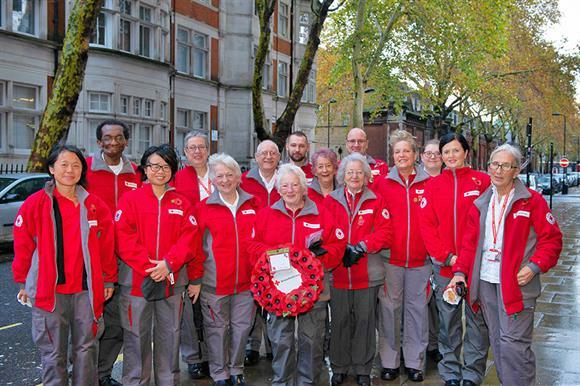 Cardogan Hall in London hosted an Armistice 100 concert, with these volunteers among those collecting for the forces mental health charity Combat Stress. Help for Heroes was among a number of charities that had funds raised for them by members of the public, including the Crystal Palace footballer Connor Wickham, who pledged to donate money for every retweet of the image below. And St John Ambulance decorated one of its vehicles with poppies for Remembrance Sunday. Across the country, the public also joined in to give their thanks and to remember the war dead. Girlguiding Wargrave, in Maidenhead, painted stones with poppies for the anniversary. The 63rd Reading St Michael’s Scout Group also paid tribute.